A team of scientists has come up with a plan they say could help rebuild the Arctic ice cap. The ice cap is a huge area of sea ice that covers most of the Arctic Ocean all year round. Usually, the sea ice gets thicker and spreads further each winter, but this hasn’t happened for the past few years. 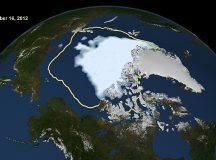 Last month, the ice cap had shrunk to its smallest size since scientists began keeping records of it 38 years ago. The weather in the Arctic has been unusually warm this winter. Some days, temperatures have been 20 degrees Celsius higher than is normal for this time of year. This month, the temperature was above 0°C at least one day.